Home / Amaechi / APC / PDP / Politics / Rivers State / Amaechi called on the pastors to return the alleged bribe collected from the PDP. 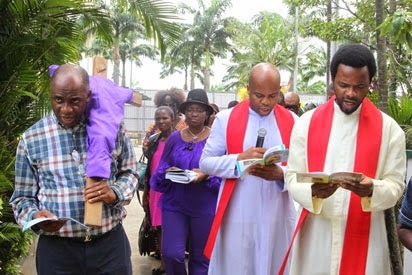 Amaechi called on the pastors to return the alleged bribe collected from the PDP. “They gave them N6 billion. They should return it to the Federal Government coffers. They will tell you that Buhari wants to Islamize Nigeria; tell them we are too educated. I am a Catholic, but no Catholic priest has told me that story right now in the Catholic Church because, I will ask him how. “If any pastor tells you that, tell him to return the money. Nobody can Islamize Nigeria. They have commercialised Jesus Christ. They should stop commercialising Jesus Christ. He is our Lord and Saviour. “You know what Jesus Christ did in the temple, he chased them away. We shall chase away those pastors who have collected money from PDP to tell us lies. We shall chase them away on behalf of our Lord Jesus Christ.